The Yankees (76-66) lost to the Tampa Bay Rays, 4-2, on Sunday, September 11, and ended their seven-game winning streak. They are now four games behind the Boston Red Sox for first place in the American League East and tied with the Detroit Tigers for two games behind the Baltimore Orioles for the second wild card spot. “Every loss at this point stings just because of how few games are left,” manager Joe Girardi said. The Yankees have won seven of their last 10 games but could have really benefited from winning on Sunday because their schedule is about to get much more challenging than the 60-82 Rays. In their next three games, they will closeout their home stand with the Dodgers, who are 80-62 and in first place in the NL West and then will play the rest of their games against teams ahead of them in the AL East, except for three games in Tampa Bay from September 20-22. This will give them opportunity to directly gain ground in the division and wildcard but will also automatically lose ground with any losses. Rookie Luis Cessa, who had allowed three runs or less in his four starts this season before Sunday, was hurt by the home run as the Rays slugged three round trippers against him in 5.2 innings. He ended up allowing four runs on five hits while striking out five in 78 pitches. Cessa has been a reliable starter so far as his array of pitches helped him have a 4.07 ERA going into yesterday’s game, but he needs to prevent so many homers since the opposition has hit eight homers in his 29 innings as a starter, and in his 47.2 innings overall the opposition has hit 13 homers. A positive to yesterday’s start is that Logan Forsythe and Brad Miller both hit solo homers in the sixth. If they would have hit two or three-run homers then the game would have been out of reach and much more difficult to make a comeback. Chase Headley hit his 14th homer of the season in the fifth inning, but the Yankees were only able to score one more run after that. In the seventh inning, Brett Gardner singled to right to drive in Headley for the team’s second and final run. During Sunday’s afternoon game, the Yankee had a total of seven hits but were only 1-5 with runners in scoring position (RISP). Jacoby Ellsbury was 0-2 with RISP, Mark Teixeira was 0-1 with RISP and Gary Sanchez was 0-1 with RISP. Ellsbury flied out with Gardner on second to end the seventh inning and he also flied out to left after Gardner doubled to deep left in the third inning. To end the third, Sanchez struck out with Gardner still on second. The Yankees were not able to do anything in the last two innings since the Rays retired the side in order in the 8th and 9th innings with Brad Boxberger and Alex Colome pitching. The Rays closer, Colome, picked up his 32nd save of the season and lowered his ERA to an impressive 2.01. Luis Severino pitched well once again but will unfortunately likely not be available for two or three days because he threw 2.1 innings in the loss. He held the Rays scoreless while allowing only two his and a walk while striking out three. 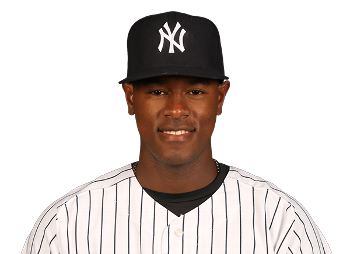 Severino, who was sent to Triple-A earlier in the season due to ineffectiveness as a starting pitcher, has now not allowed an earned run in his 16.2 innings pitched as a reliever this season and has only given up four hits in those seven games out of the bullpen. The Yankees will now play three important games against the Los Angeles Dodgers. LA is coming off of a series where they lost two of three to the Marlins in Miami and former manager Don Mattingly. The Dodgers will send out rookies Jose De Leon and then Julio Urias in the first two games and then 2014 Cy Young winner and likely the best lefty in baseball, Clayton Kershaw, will make his second start since coming off of the disabled list on Wednesday. It’s important that the Yankees win two out of three games to keep pace or possibly gain ground on the teams ahead of them in the standings. Luis Severino, who allowed five runs in 4.1 innings in his return to the rotation on Tuesday in Boston against the Red Sox, was sent back to Triple-A Scranton to work on his change-up and other pitches on Wednesday. He is only 22, but likely deserved to stay in the rotation because the Red Sox have one of the best offenses in baseball. Severino had previously made three appearances out of the bullpen before coming back to the rotation after Ivan Nova was traded. In his three games out of the bullpen, Severino threw 8.1 innings, only allowed one hit, not allowing an earned run to go along with 10 strikeouts and three walks. Based on those stats out of the bullpen he deserved to show what he could do as a starter again, but the Yankees were not impressed with his pitch selection. In Severino’s 10 starts with the RailRiders between May 13 and July 27, he had a very good 3.25 ERA, 1.08 WHIP, seven wins, a .223 batting average against, 57 strikeouts, and 15 walks in 63.2 innings. He allowed only two runs in three of his last five starts before being called back up to the Yankees, which included a six-inning start where he allowed two runs, five hits and struck out an impressive 11 batters in his start July 20. When he goes back to the RailRiders he will need to work on his fastball command and make his slider much more consistent. He will also need to get more confident in throwing his changeup as he only threw two or three. If he can improve his change and have more confidence in it that will allow him to have a third pitch he can rely on. Severino did say after the game that he used to have more confidence in his change. He will likely be brought back up to the Yankees once rosters expand on September 1, and will look to be able to have the dominance as a starter that he had in the last two months of last season. He proved that he can have a lot of success against major league hitters in his 11 starts last season, but he will now need to prove he can again as the rest of the league now has more of a scouting report on him. From the beginning of August until the beginning of October (11 starts), Severino had an excellent 2.89 ERA, 1.20 WHIP, 22 walks and 56 strikeouts in 62.1 innings. He allowed two runs or less in eight of his 11 starts. He also struck out five batters or more in seven of his 11 starts. His main weakness was that he walked six batters or more in six of his starts. He was able to prevent those walks from doing too much damage as he allowed less than three runs in three of those starts, but walks usually have a way of hurting a pitcher. Severino had much better control when he pitched for the RailRiders earlier this season as he allowed one or zero walks in five of his last six starts. It seems like it would have made more sense to have Severino work through his pitch selection and improve his secondary pitches with the Yankees he is one of the young players that the Yankees want to evaluate. Sending Severino back down to Triple-A would have made more sense if the Yankees were facing the Tampa Bay Rays, who have scored the second fewest runs in the AL (454), but the Red Sox lead the league in runs scored with 603. Another reason that this move doesn’t make sense is that Chad Green or whoever replaces Severino is not the pitcher that Severino is. However, if he is able to feel more comfortable relying on his change, improve his fastball command and make his slider more consistent in the next 2.5 weeks, then it would have been a very productive time spent in Triple-A. Based on how Severino performs the rest of the season the Yankees will know what they have in him and if he makes more sense in the future as a relief pitcher or starter. Even though he has allowed more than three runs in five of his eight starts this season, he still has his 11 starts from last season, and can prove in September that he can be a productive starting pitcher going forward if he can make some adjustments. After winning two out of three games against the Tampa Bay Rays, the Yankees will now play their most important six games since the 2012 season, which is the last time that they made the playoffs. The Yankees are currently 3.5 games behind the first place Toronto Blue Jays, which makes this upcoming stretch of games against the Mets and Blue Jays so important. They have a four-game lead on the first wild card spot, but they want to win the division so that they are secured a postseason series. This series that begins tonight at Citi Field is important for the Yankees because the Mets can only look to play spoiler at this point. They have basically locked up the NL East since they have a 83-63 record with an 8-game lead over the Washington Nationals in the division. 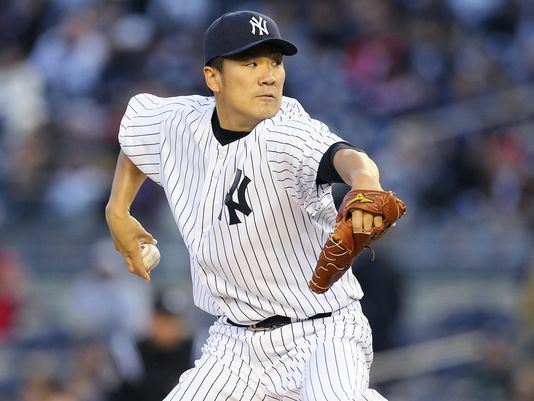 Masahiro Tanaka will get the start for the Yankees tonight and in his last start the 26-year-old did not allow a run and struck out seven in seven innings pitched against the Toronto Blue Jays. In his start last season against the Mets he pitched a complete game shutout with eight strikeouts. The Mets have a much better offense right now with the additions of Yoenis Cespedes, Michael Conforto and Juan Uribe, but if Tanaka pitches like he did in his last start he is hard to hit. Steven Matz, who is a Long Island native, will get the start tonight for the Mets and he will be feeling the pressure of pitching in his first Subway Series game. He has had a lot of success as he has allowed two runs or less in all four of his starts, which has led to a 1.88 ERA, but he has never pitched against the Yankees. Adding to the intrigue of this game is that Tanaka will hit in a game for the third time this season. Here are the pitching matchups for this important first game of the Subway Series. The Yankees beat the Tampa Bay Rays on Wednesday night, 3-1, in the final game of their series at Tropicana Field. It was a big win for the Yankees because they were able to stay three games behind Toronto in the AL East since the Blue Jays routed the last place Atlanta Braves 9-1. After last night’s win, the Yankees are now only seven wins away from 10,000 in franchise history. Luis Severino only allowed one run in 5.2 innings pitched while striking out seven in what was his most important start as a Yankee. The Yankees still have a chance in the AL East partly because they have won four of the last five games that he has started. The team could not have asked for anything more from their highly regarded rookie as he has a 3.12 ERA and 45 strikeouts in his eight starts and has allowed two runs or less in six of those starts. “It’s great to help the team win,” Severino said after the game. He has only allowed more than two runs twice, and both of those starts came against the Blue Jays. He allowed three runs in six innings in his first start against Toronto, which means that nine of the 15 runs that he has allowed have come against Toronto. That is not surprising because the Blue Jays have scored 102 runs more than the the Yankees, who have scored the second most runs in baseball. In his previous start, on September 11 against the Blue Jays, Severino gave up six runs on six hits and three walks in only 2.1 innings, which means that he was able to rebound very well after that sub-par performance. Severino had not allowed a run until the sixth inning when Steven Souza Jr. doubled to center with one out to score James Loney. He struck out Nick Franklin swinging with two outs and then Justin Wilson came on in relief as Severino had thrown 94 pitches. “He bounced back extremely well, which is good to see,” Yankees manager Joe Girardi said. Some rookies will struggle after performing like Severino did against Toronto, but he was impressively able to pitch like he previously had. Chase Headley had what ended up being the game-winning RBI in the top of the sixth inning with his single to shallow left that sent Brian McCann home to make the score 2-0. That was Headley’s only hit of the game and that hit snapped his 10 at-bat hitless streak. Greg Bird, who was 2-4, drove in the first and third runs that the Yankees scored. He was once again a critical part in a Yankees win. In the second inning, to give the Yankees a 1-0 lead, Bird hit a double to right center to score Carlos Beltran. In the ninth inning, to give the team an insurance run, Bird hit his seventh homer in his 29 game played of the season. Seven homers and 21 RBIs are very productive power numbers for a rookie who has not even played in 30 games. The bullpen pitched 3.1 combined innings and only allowed one hit. 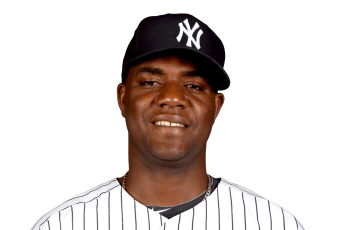 Wilson only need 12 pitches to strike out two in his inning, Dellin Betances threw 1.1 innings and had to get out of trouble as he walked the bases loaded in the seventh and Souza Jr. hit a single off of him in the eighth, but he was able to get a key double play and strike out. Andrew Miller (1.80 ERA) struck out all three batters he faced in the ninth to record his impressive 34th save of the season in his first year as a closer. Chris Archer, who pitched well against the Yankees once again, allowed the first two runs that the Yankees scored. He pitched six innings and allowed four hits and four walks. He broke the Rays’ single season strikeout record with his third inning strikeout of Brett Gardner. That was his 240th strikeouts, which broke Scott Kazmir’s record. The other positive offensively was that Jacoby Ellsbury, who had not had a hit in his previous 22 at-bats, went 2-5 in what was his first multi-hit game since September 6. The Yankees need this to be a sign of him hitting with more consistency. The Yankees have their last off day of the season today before playing 17 games in 17 days to end the season. The Yankees play three games against the Mets at Citi Field starting on Friday and after that series will play an important three-game series at the Rogers Centre against the Blue Jays. Those six games will go a long way towards deciding if the Yankees win the division or get one of two wild card spots. The Yankees beat the Tampa Bay Rays, 4-1, on Monday night at Tropicana Field, as Slade Heathcott had the biggest hit of his rookie season. With the win, the Yankees gained a half a game in the AL East to move three games behind the first place Toronto Blue Jays. Tampa was winning 1-0 going into the top of the ninth after Logan Forsythe hit a double off of Justin Wilson to score Mikie Mahtook, and it appeared that the Yankees were on their way to a deflating loss, but Heathcott hit a 3-run homer to drive in Brian McCann and Chris Young that landed just over the wall in left field. John Ryan Murphy gave Heathcott a quick scouting report on Rays closer Brad Boxberger and it ended up helping because Heathcott’s blast gave the Yankees a big come from behind win. Heathcott pinch-hit in the ninth and it was his first at-bat in the majors since May 27, when he went on the disabled list. He was called up from Triple-A on Saturday. 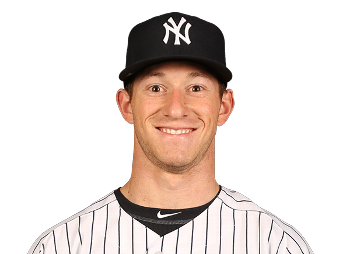 Heathcott now has a .389 average with two homers, six RBIs and four runs scored in 18 at-bats. Alex Rodrguez was impressed with how Heathcott was able to step up in such an important at-bat. CC Sabathia, who had what was his biggest start of the season, thought the same about Heathcott’s hit. “You just look at our dugout, the way they reacted, it’s the biggest hit of the season,” CC Sabathia said of Heathcott’s blast. The Yankees are now 3-54 when trailing after eight innings. Brett Gardner stole second after drawing a two out walk in the ninth. Alex Rodriguez was able to keep the game alive and get the Yankees on the scoreboard with a double to deep right that scored Gardner. That was Rodriguez’s 82nd RBI of the season, which is tied for 12th in the American League. Sabathia allowed zero earned runs in a start for the first time this season. He pitched 6.2 innings, only allowed three hits and recorded six strikeouts. Sabathia gave the Yankees much more length on Monday as he allowed one run in 4.2 innings in his previous start. Andrew Miller pitched a perfect ninth inning and struck out three batters for his 33rd save in his first season as a closer. His ERA is now an outstanding 1.83. The Yankees had three errors during the game, but as a result of their ninth inning rally with two outs it didn’t cost them the win. The victory made their chance of catching the Blue Jays more realistic. Adam Warren will make the start in Game 2 of the series since Nathan Eovaldi has elbow inflammation. It will be Warren’s first start since June 25. The Yankees lost the middle game of their series against the Tampa Bay Rays at Yankee Stadium by the score of 3-2. This was a crushing loss since they had many chances as they were 0-5 with runners in scoring position and the loss combined with the Toronto Blue Jays win over the Baltimore Orioles pushed the Yankees deficit in the AL East back down to 1.5 games. Nathan Eovaldi, who lost his first game since June 16 and is now 14-3, allowed three runs on five hits and four walks in 5.1 innings pitched. It was his second consecutive start that he struggled with his command and effectiveness since in his previous start he allowed five runs in five innings pitched, but was able to get the win because the Yankees had scored eight runs when he left the game. John Jaso hit a single to right off of Eovaldi to leadoff the game and he continued to struggle as eight of the first 15 batters that he faced reached base. He was able to get Evan Longoria to hit into a double play to end the first, but the second and third innings were his downfall. In the second inning, Kevin Kiermaier, who is more known for his defense, singled to right to score Logan Forsythe, who had doubled earlier in the inning. In the third inning, Eovaldi couldn’t locate his pitches at all as he allowed a walk, a hit by pitch and then another walk to Grady Sizemore to load the bases. Asdrubal Cabrera hit a single to right to score Daniel Nava and Longoria to give the Rays their third run of the game. He would retire seven of the next nine batters that he faced, but had to leave the game after 5.1 innings because he had thrown 102 pitches (seven strikeouts). 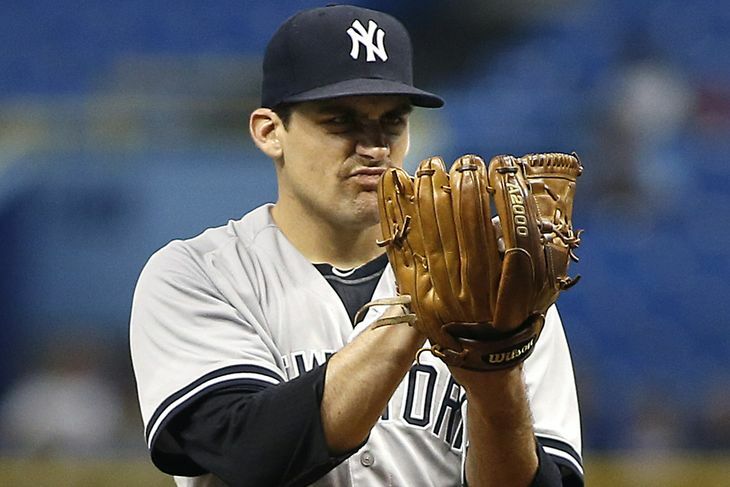 “I didn’t have good command of my fastball and my splitter was inconsistent,” Eovaldi said. The splitter is the pitch that has transformed Eovaldi into a more complete and at times dominant starter this season, and he will have to throw it with more consistency in his next start. Matt Moore, who had an 8.78 ERA in his six starts this season coming into the game, allowed two runs on three hits and two walks in his 4.2 innings. In the fifth inning, Didi Gregorius hit a double to deep center to score John Ryan Murphy who showed his speed as he was able to score all the way from first base. Murphy is likely the fastest back-up catcher in baseball. Later in the fifth inning, Brett Gardner’s ground out to the shortstop scored Gregorius. The Yankees had the bases loaded in the eighth inning after pinch hitter Brian McCann walked with two outs, but Gregorius hit a hard line drive to the second baseman. The Yankees had the hitter they wanted at the plate since in his last eight games Gregorius has 15 hits in his last 29 at-bats (.517) with eight runs scored, two homers and 11 RBIs, but he unfortunately hit it right to Forsythe. Four pitchers from the Rays bullpen combined to pitch 4.1 scoreless innings while only allowing two hits. That was another reason that Tampa Bay won the game. The Yankees would have won the game if they had more success with runners in scoring position and if they left fewer than nine runners on base. Gardner, Alex Rodriguez and Carlos Beltran, who were the No. 1, No. 3 and No. 4 hitters in the lineup, combined to go 1-12 with three strikeouts. The offense didn’t homer and the team is now 11-25 this season when not hitting a round tripper. An opportunity that the team should have taken advantage of was missed on Saturday because the Yankees will now face the challenging Chris Archer in the series finale at 1:05 p.m. Archer is one of the best starters in the league as he has an impressive 2.78 ERA with a 1.04 WHIP and 223 strikeouts. He didn’t allow an earned run in six innings in his previous start, and in six starts against the Yankees between the 2012 and 2014 seasons he had a 1.93 ERA. The Yankees will have to hope that Archer is not able to command his pitches like he normally does. Ivan Nova, who allowed three runs in six innings in his last start, has a 4.50 ERA in 12 starts this season. He needs to locate his sinker, curve and four-seam fastball better than he has in his previous two starts.